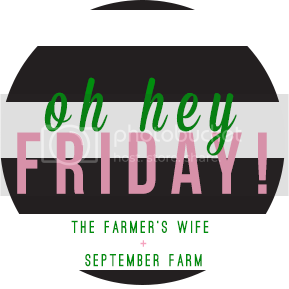 I am pretty pumped to link up with Karli of September Farm and Amy of The Farmer’s Wife this week. I have been looking for a good link-up and found it through my dear friend Jessica at The Newly. If you like what I write, you’ll also love what these beautiful ladies write. If you have a spare minute, check ’em out! I’m not talking about physical fitness, although it can be totally exhausting trying to be inventive and interactive with your kids all day. No; I am talking about clothing. I’m talking about the fact that the minute I put on an outfit that I am somewhat proud of, my little Bear decides that he needs to add an accessory…a little spit up or diaper leak should do the trick. It takes everything I have to try to make sure that I have dabbed on a little make-up to look good for my husband when he gets home. Most of the time, my hair is atop my head in a sock bun and I manage to wrangle myself into some shorts and a loose tank. Sometimes, I even spring for some blush and mascara. That’s only when he’s really lucky. Most SAHMs want everything to be perfect for their spouses homecoming…or at least the SAHMs I’ve talked to. I sincerely want my home to be spotless when he comes home and I want dinner to be ready for him to eat and a bouncing happy baby boy ready to play with daddy the minute that he gets home. This doesn’t always happen…but I try my hardest to make sure it does. That leaves little time for me. Sure, I still get my run in with my little guy who likes to look at the trees and cars and people. I figure we can knock two things out with one stone: a little activity for both of us. Showers are a commodity. I swear, my readers must think I smell like a sock…and sadly, a lot of times, I do. This fall; however, I pledge to stay stylish and clean for my husband…or at least…most days. Here are my top 10 fall fashion must-haves for the season. Ok, so tee shirts pretty much rule in our home. They are functional and practical but most of my tees look a little plain. The graphic tee is the perfect update to the wardrobe as it can be paired with anything. I have high hopes to not only pair with jeans, but my chambray shirt and ankle pants, a midi skirt, my jean shorts and blazer…etc. I feel like this was a necessary purchase. 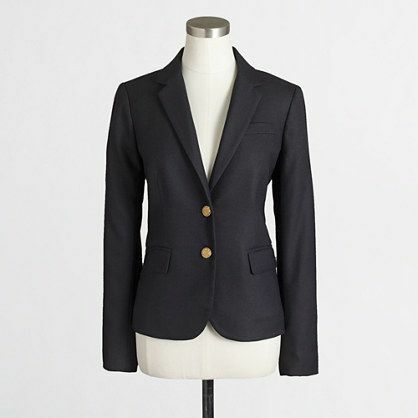 I have been in the hunt for a beautiful black blazer for a while now, as my workhorse H&M blazer (that I probably bought in 2008 for $29.99) needs to retire…sadly. This is the perfect price point for me to take the plunge into an upgraded blazer…and I got it for 30% off! I can’t wait to hang it up in the closet and save it for nights out with Steven, or moments when little B and I are on the go and I want to look a little more put together. 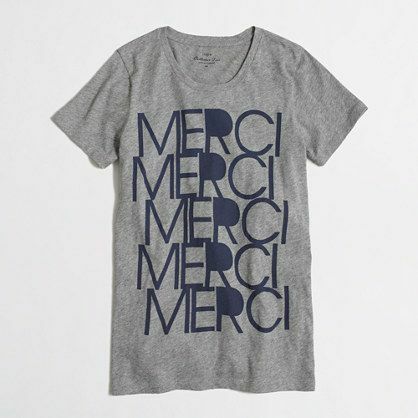 Great with the graphic tee, over dresses, with pants…anything really! I don’t know if any of you other mommies got this after having your baby, but pregnancy really did a number on my posture, which then gave me the flattest booty I’ve ever had. It is sad. 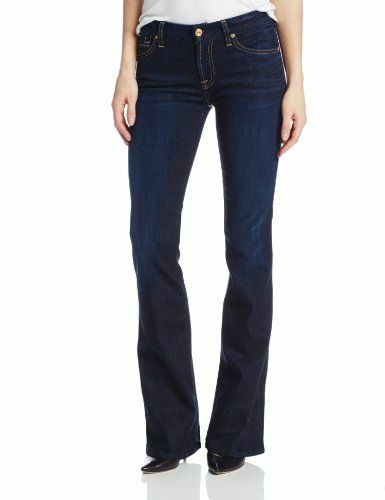 I miss that part of my pre-pregnancy body; however, this is why I am super excited about the boyfriend jean trend…these aren’t intended to be super tight, which gives me a little wiggle room. Pun intended. Army green….army green…army green. I’ve seen more camo and army green than ever before and for the first time in my life…I want it. Everything seems so practical…which again…is exactly what I want this year. 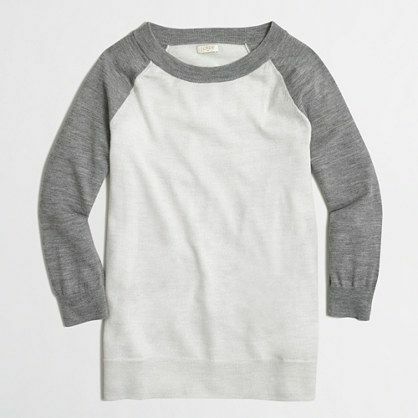 I used to wear my baseball tee just about everywhere. They are so wonderfully cozy and perfect for the fall. Now, you can get the same look in a sweater…need I elaborate? Seventies shapes were super popular on the fall fashion runways this year, and I am making (yet another) plea to women everywhere…pleeeeeeaaaassse bring flared jeans back. 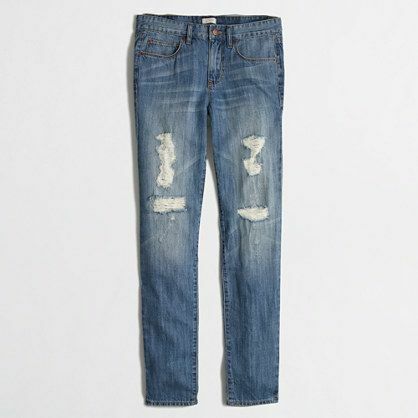 These are infinitely more flattering than any skinny jean I have seen on any woman. If you need any inspiration to wear your flares, check out my Pinterest board: Friends of Flared Jeans. These beauties will be in my closet in two days…woo hoo! Despite my shopping list changing frequently, this bad boy stayed in my shopping cart. 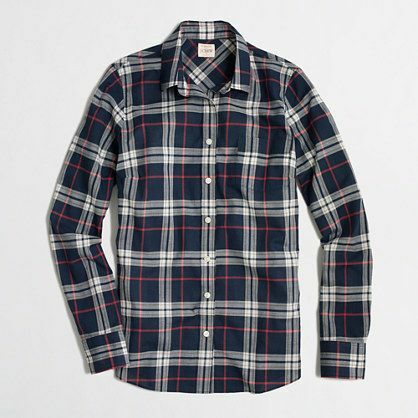 I can’t wait to pair it with flared/boyfriend jeans and heels, my sparkly pencil skirt and a cable knit sweater, boyfriend jeans with graphic tee and unbuttoned…I am so super pumped about this plaid. Seriously…can Blair of Atlantic-Pacific go wrong!? No. I dare say she cannot. I have two moto jackets. I got my first while I was teaching at CHS. I had never donned the leather jacket before, but I figured I had earned my stripes and ability to wear this thick skin. Pun intended. Moto jackets are super versatile and make any outfit look a bit edgier. I have a tan and black moto jacket and would recommend to any woman looking to spice up her wardrobe. Your Sunday Best does graphic tees and midis perfectly! I posted a link to my favorite new fashion blogger, Your Sunday Best, earlier this week. Y’all. Check her out. I’m going to post yet another image of her effortless style next as well, but is this not the most fun outfit to transition into fall!? I realize that not all of us can look like new fashion blogger, Your Sunday Best. There are very few women in the world that do. However, she does provide a fool-proof method to get you into this daring trend. OMG is she the most fab person on the planet or what?! Blair Eadie, you are my hero..and the unsung hero of all women who want to try this trend, but are too afraid to take the plunge. Buy the utility jacket from Old Navy. Just trust me, and buy it. I did and CAN’T wait to start wearing it:) Love all your picks – so anxious for fall!